Quinnipiac University Professor Cindy Kern, center, recently spent three days in Egypt educating teachers about the Next Generation Science Standards. Kern is pictured with Cairo American College teachers Charlie Saunders, left, and Gaby Morales, right. Photo courtesy of Cindy Kern. Cindy Kern of North Haven, director of the Bristol-Myers Squibb Center for Science Teaching and Learning at Quinnipiac University, recently spent three days in Egypt educating teachers about the Next Generation Science Standards (NGSS). 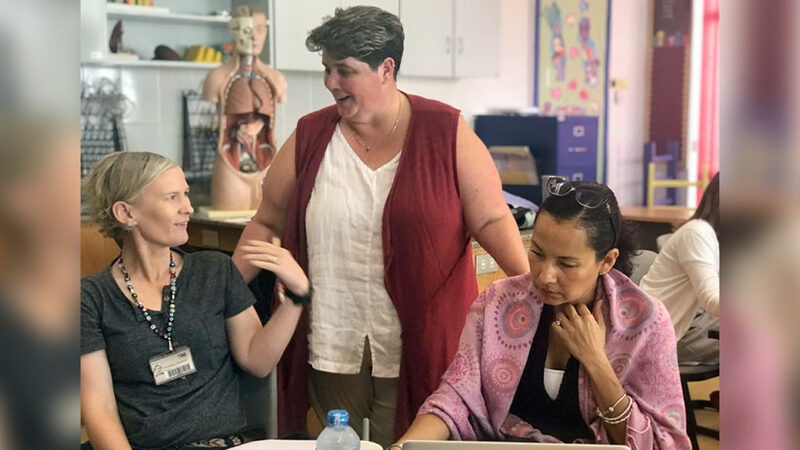 Kern and Heather Toothaker, a Clinton resident, New Haven middle school teacher and adjunct professor at Quinnipiac, visited Cairo American College from Sept. 13-19 to conduct professional development workshops on NGSS. The standards, which are nationally recognized, are focused on stimulating students’ interest in science through three-dimensional learning. Cairo American College, an international school in Maadi, Egypt, provides education to more than 800 students from pre-kindergarten to 12th grade. Quinnipiac’s Center for Science Teaching and Learning, funded by Bristol-Meyers Squibb, is a network of scientists, engineers and educators collaborating to advance the art of STEM education from kindergarten to the university level. The center hosts monthly workshops offering strategies to support pre-service and in-service teachers in the STEM field.